Cambodia is located in southeastern Asia. Cambodia is bordered by the Gulf of Thailand to the southwest, Vietnam to the east, Laos to the north, and Thailand to the northwest. Google Earth is a free program from Google that allows you to explore satellite images showing the cities and landscapes of Cambodia and all of Asia in fantastic detail. It works on your desktop computer, tablet, or mobile phone. The images in many areas are detailed enough that you can see houses, vehicles and even people on a city street. Google Earth is free and easy-to-use. Cambodia is one of nearly 200 countries illustrated on our Blue Ocean Laminated Map of the World. This map shows a combination of political and physical features. It includes country boundaries, major cities, major mountains in shaded relief, ocean depth in blue color gradient, along with many other features. This is a great map for students, schools, offices and anywhere that a nice map of the world is needed for education, display or decor. 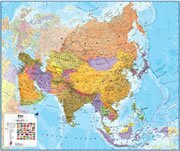 If you are interested in Cambodia and the geography of Asia our large laminated map of Asia might be just what you need. It is a large political map of Asia that also shows many of the continent's physical features in color or shaded relief. Major lakes, rivers,cities, roads, country boundaries, coastlines and surrounding islands are all shown on the map. Battambang, Kampong Cham, Kampong Chhnang, Kamport, Kohnieh, Kompong Thom, Krakor, Kralanh, Kratie, Lomphat, Lovea, Pailin City, Phnom Penh, Poipet, Ponlei, Prek Kak, Puok, Pursat, Siem Reap, Sisophon, Stung Treng and Takeo. Chhung Kompong Som, Gulf of Thailand, Mekong River, San River, Sen River, South China Sea and Tonle Sap. Cambodia's mineral resources include gemstones, iron ore, manganese, phosphates, oil and natural gas. Other natural resources include timber and potential hydropower. Although Cambodia's natural hazards include the occasional drought, the country experiences monsoonal rains and flooding from June to November. 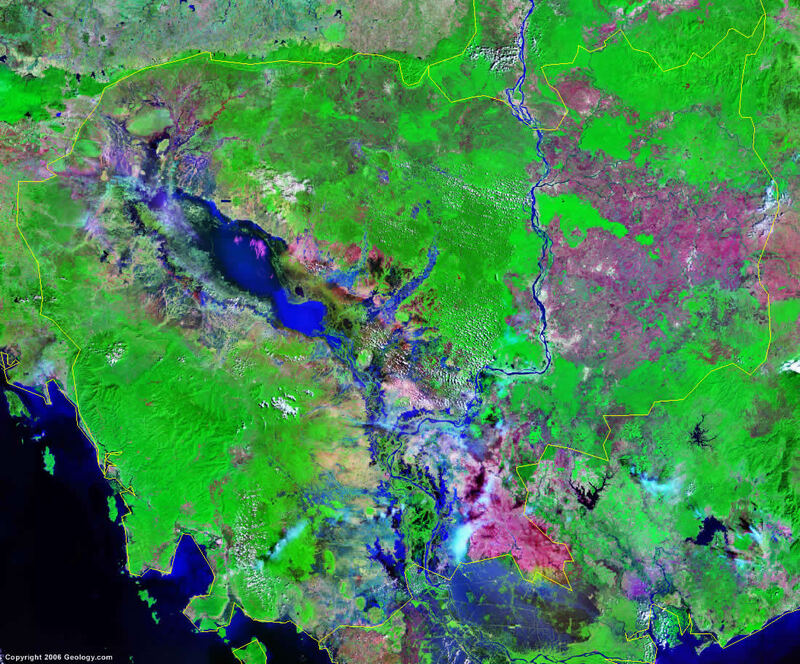 Cambodia's environmental issues include illegal logging activities and soil erosion, throughout the country. There is strip mining for gems in the western region (along the border with Thailand), which have resulted in habitat loss and declining biodiversity. This has particularly been destructive to the mangrove swamps and threatens the natural fisheries. The fish stocks are declining due to illegal fishing and overfishing. In the rural areas of Cambodia, most of the population does not have access to potable water.